FAO dr. sc. Mirjana Matausic-Pisl, dr. vet. med. We are writing to you today after receiving a number of e-mails and online social network announcements from disgusted citizens who have been informing us about the horses that are being abused in woods of Velebit by Gracac. In the photos we are sending in attachment you can see exhausted and sickly horses overloaded with huge amount of logs and collapsing under their loads. It seems that one of the horses is dead, while on another photo, next to an overloaded horse, you can see two men - Adis Dizdarevic and Izet Muratovic. 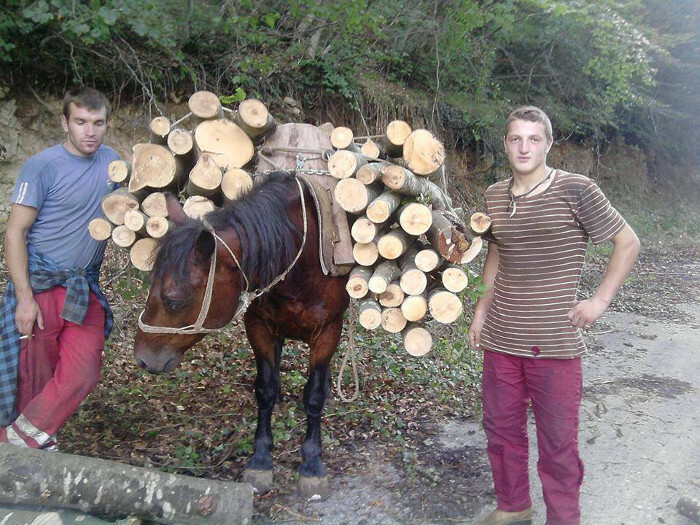 On their Facebook profiles, where the photographs were published, it said that they are from Bosnia and Herzegovina, and that the photographs of horses carrying logs on their backs were taken on Velebit by Gracac. After condemning comments were made by members of online social networks because of the treatment of the horses, the photos were deleted from their profiles. 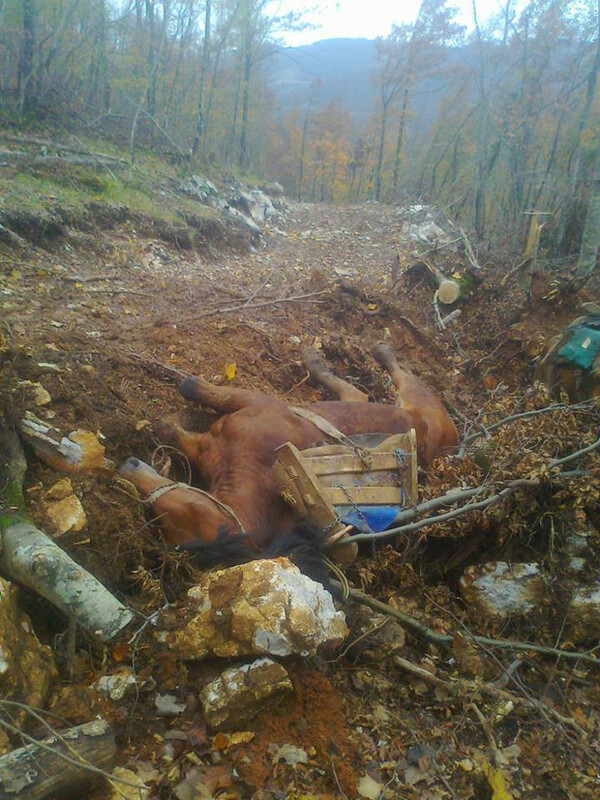 The photographs illustrate the regular practice on Velebit where horses are brutally used for harvesting wood. Apart from the fact that foreign nationals, and even Croatians, are illegally cutting down Velebit's trees, they are also breaking the Animal Protection Act and the Criminal Law because of this conscious and deliberate animal torture. 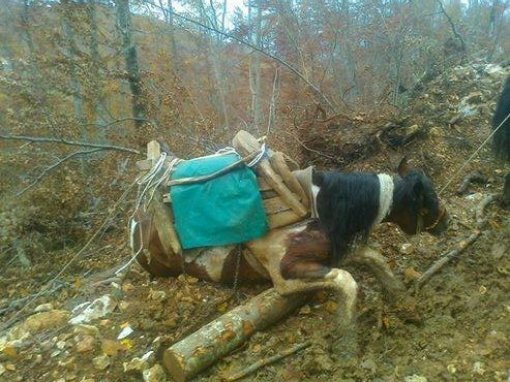 The horses are forced to carry heavy logs without being given food and water which is why they often collapse under their load, suffer painfully and are left to die, which is documented on photographs. Even though horse exploitation for work is not yet banned by law, it is clear here that the horses are forced to work harder than their physical strength allows and that their owners are mistreating them without mercy. During such heavy physical work, the horses' legs and backs suffer. Even from long term exposure to the weight of a rider, blood circulation can be cut off to important areas due to constant pressure on the back muscle tissues. Tissue deformation in a horse's back starts after 12-15 minutes of being exposed to the weight of a rider, and after 30 minutes there is also pain. Everything after 30 minutes can cause trauma to the tissue, such as partial or full muscle dystrophy. The total weight of the wood that is loaded on the horses exceeds the weight of the average rider, which means that the horses are exposed to unimaginable pain. 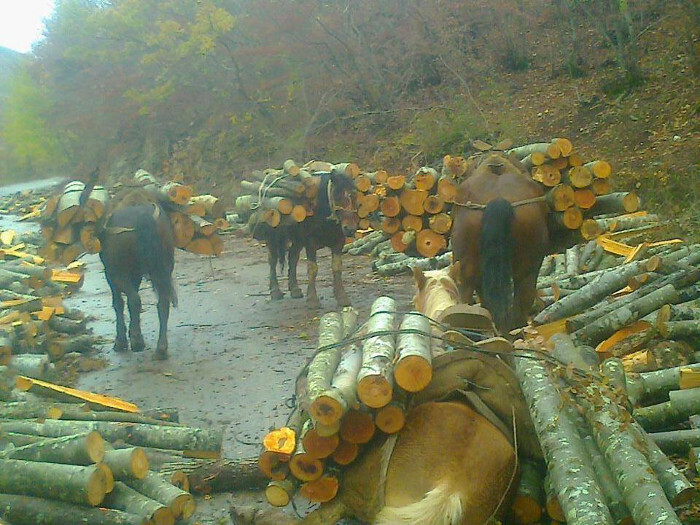 This forced physical labor illustrates a callous disregard for the horses' health and lives. The aforementioned animal abuse and torture clearly shows that provisions to the Animal Protection Act have been broken, especially those provisions that forbid inflicting pain, suffering and injury to animals; exposing animals to fear, unfavourable temperatures and weather conditions; and neglecting animals with regards to their health, housing, diet and care. Sadly, these provisions do not actually help horses because the horses continue to be relentlessly exploited and forced into doing heavy labor that is beyond their phyiscal capabilities. Using animal labor in forestry became unnecessary at the beginning of the 1960s when forestry machinery was developed and could operate on any terrain, even steep terrain, making it more effective than animal labor. 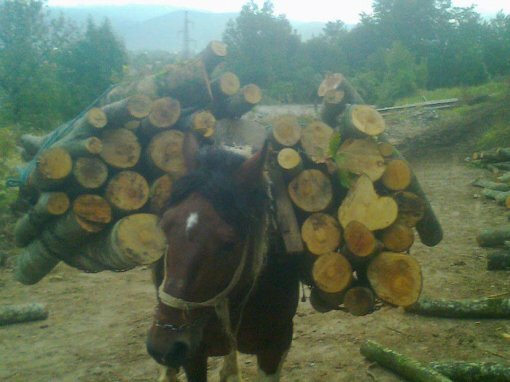 Experts state that there is no point to using horses as working animals in the 21st century when heavy physical jobs have been transferred from man to modern machines. Considering all of the above, we urge the Ministry of Agriculture and the Veterinary Inspection to enforce the Animal Protection Act with the aim of protecting the welfare of horses and sanctioning the persons responsible. We also request that future changes to the Animal Protection Act include a ban on exploiting horses as so called "working animals," in order to enable effective animal protection. Using horses for labor in the 21t century is neither ethical nor needed, and in Croatia, as a European Union member, there is no room for outdated, abusive and unacceptable treatment of animals. We are looking forward to your reply within the legally prescribed timeframe so that we can inform the public about it.